SentryOne supports restricting server visibility within the SentryOne client through the application of Rights Based Security. Assign users and groups a limited set of visible sites, target groups, or instances to restrict what the logged-in user sees. Certain objects and commands are disabled for restricted users. For more information, see the Objects Hidden from Restricted Users topic. Associate a SentryOne User or Group with a Windows or SQL Server Authentication account. Assign a SentryOne User or Group rights that restrict server visibility within the SentryOne client. Note: Associate a Windows Active Directory security group with a SentryOne group. This allows you to easily manage SentryOne client security for many users. 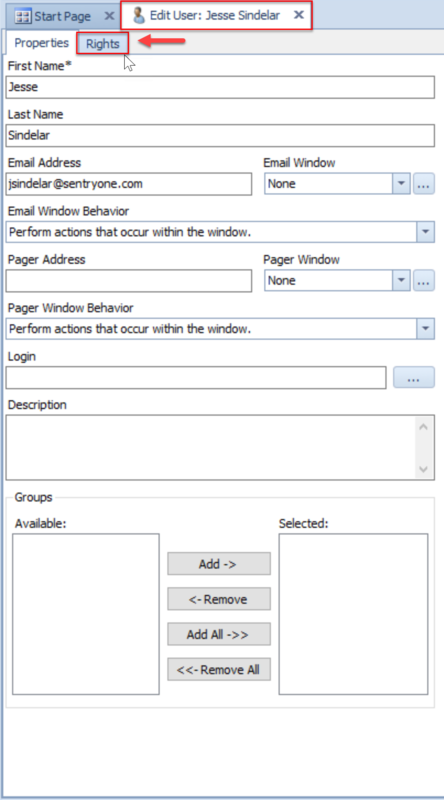 Specify the Active Directory group from the Group Properties tab in the Login field. The first step in configuring Rights Based Security is to associate a SentryOne user with either a Windows account or a SQL Server Authentication account. This account should be the same account that the user uses when opening the SentryOne client. For more information, see the Connecting to an Installation topic. 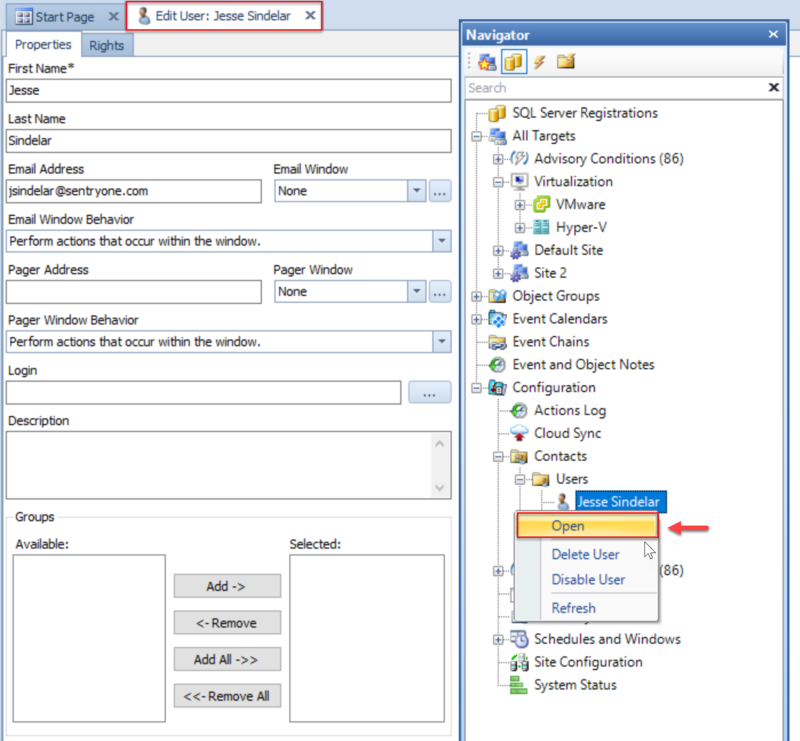 Open the Navigator pane (View > Navigator), expand the Contacts node, and then the Users node. Double-click the user you wish to assign an account to, or select Open from the context menu to open the Edit User window. If no user exists, double-click on the Users node to create a new user. 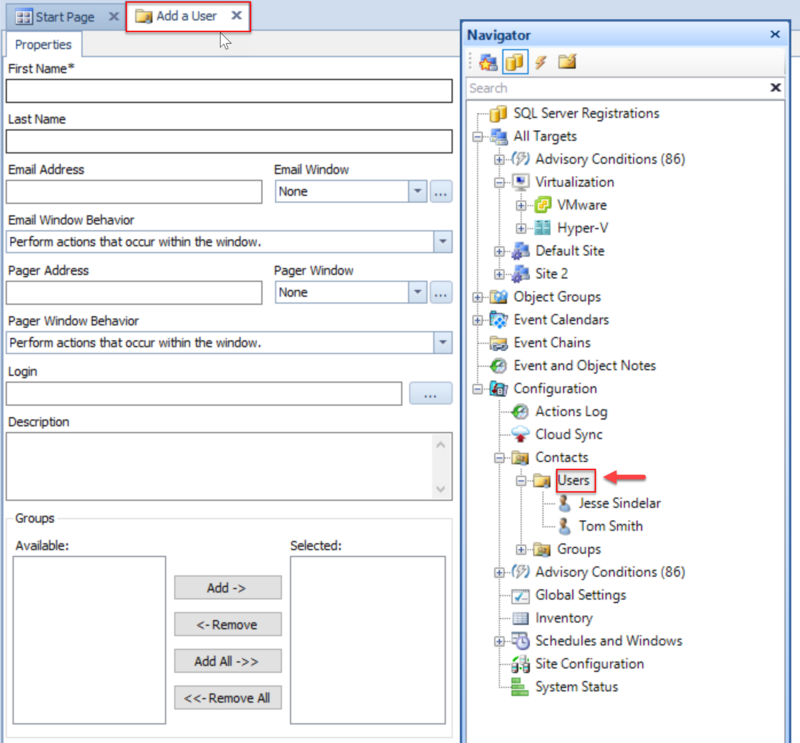 Enter their user name in the Login field as Domain\Username if the user connects to the SentryOne installation using Integrated Windows Authentication. 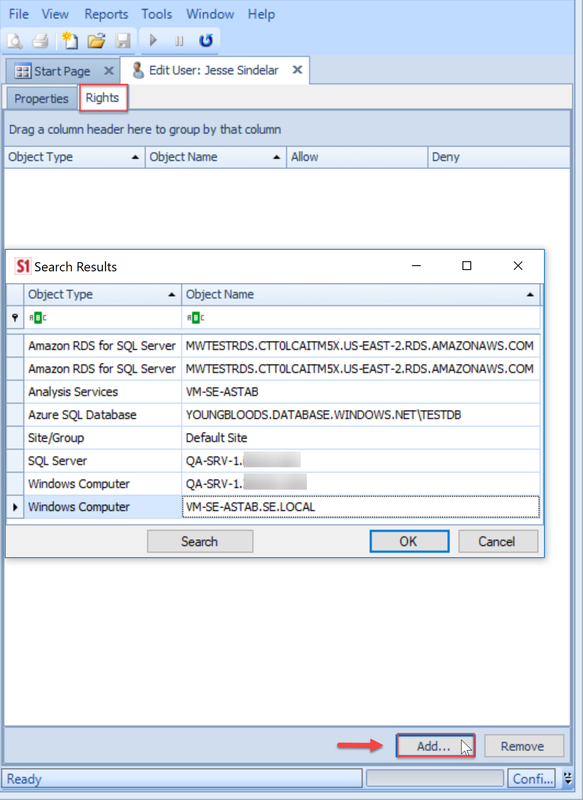 Enter their SQL Server Login name in the Login field if the user connects to the SentryOne Installation using SQL Server Authentication. Save the User by selecting Save on the toolbar. Note: If the user or group is newly created, it may be necessary to Save and then reopen the User or Group before the Rights tab becomes available. Note: New users have complete access in the SentryOne Client by default. From either the User or Group editor, select the Rights tab at the top of the editor. Any restrictions previously assigned are listed, otherwise the list is initially empty. At the bottom of the Rights tab, select Add to open the Search Results window that shows a list of available instances. Select the instances that you wish to configure rights for from Search Results. The instances are added to the Rights tab with checkboxes to Allow or Deny visibility. 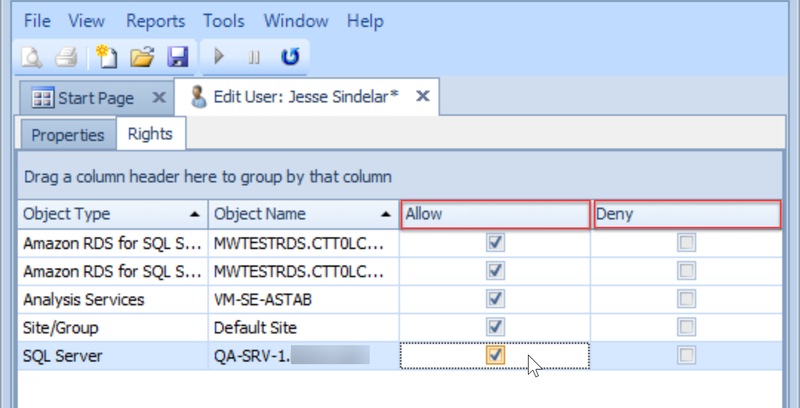 Select the Allow or Deny checkboxes for each desired instance to Allow or Deny visibility to the user or group. Save the changes by selecting Save from the toolbar. The user now only be sees the instances in the Rights tab that have Allow visibility. Important: If no instances exist in the Rights tab, the user or group can see all instances, unless they are a member of another group that has a restricted set of visible instances. Warning: Once you define rights for a user or group, any site, target group, or instance that doesn't have rights explicitly defined, becomes implicitly denied to that user or group. This means a user or group is denied visibility for any site, target group, or instance that's not listed in their Rights tab with an Allow checkmark. Any Parent node (site or target group) with a Deny permission explicitly configured overrides any of its Child nodes Allow permissions. If a Parent node is being implicitly denied, Allow permissions configured for any of its Child nodes are honored because rights aren't otherwise explicitly defined for it. Edit the login associated with a user. Assign rights to users and groups. To ensure that a user has rights to log in to the SentryOne Database, but doesn't have rights to modify their own permissions, add the user to the allow_all database role of the SentryOne Database, and ensure the user isn't a member of the db_datawriter role. For more information about the available SentryOne Database roles, see the Role Based Security topic. Note: The Contacts node isn't hidden if the user is sysadmin for the SentryOne database. Note: Client alerts and object notes are only visible for the instances that the user has rights to see. There needs to be two different groups Group A (10 Users) and Group B (10 Users) with visibility to different servers. One of the users (AllButOne) needs access to all but one of the servers allowed in Group A and Group B. Add the 20 users in the client. Create a Group A with rights to servers 1-50 by adding them on the Rights tab and selecting Allow. Create a Group B with rights to servers 51-100 by adding them on the Rights tab and selecting Allow. Add the users to their respective groups on the Groups > Properties tab. Create user AllButOne and add to both groups. 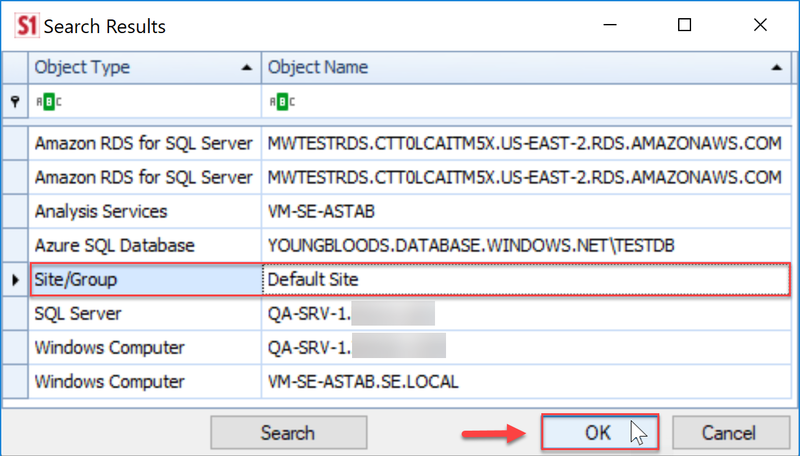 On the Rights tab for the AllButOne user, select Deny for the server the user shouldn't be able to access. SentryOne checks groups for restricted instances first. After the group membership has been evaluated, user instance restrictions are evaluated. Note: Deny overrides any Allow that's configured through a group.